UPDATE: ALL DOWNLOADS LISTED IN THIS POST FOUND HERE. The modified VBIOS files listed here have this limit unlocked, some have increased stock clocks or tweaked voltages. Just refer to the description. Increased software overclocking limits & optimized for no throttling. Read the included 'Read me' file before flashing. For all mods: Use at your own risk. All the vbios listed here are attached at the end of the post. Can be used for all current 880m (Clevo, MSI and Dell). 'OC edition' -> see above. Refer to the file name to know which version is suited for your system. NOTE: Only for the Kepler version of the 860m. Silly Nvidia started giving different GPUs the same name. Can be used for all current 780m (Clevo, MSI and Dell). same with increased 3d voltage ('OV') -> refer to the file name (Same warning as above applies to P1xxHM users). Should work on all K3000m, unless you got a board ID mismatch. It's Dell but should work on all K5000m, unless you get a board ID mismatch. MSI 670mx (1.5GB) - 80.04.5B.00.A5_'OCedition'_rev00 -> higher software overclocking limits, tweaked performance at high clocks. Same board as the Clevo card. Clevo 670mx (3GB) - 80.04.58.00.03_'OC edition'_rev02 -> same as above, plus voltage is adjustable per software. MSI 675mx (2GB) - 80.04.58.00.14_'OCedition'_rev00 -> higher software overclocking limits, tweaked performance at high clocks. Clevo 675mx (4GB) - 80.04.58.00.05_'OCedition'_rev00 -> higher software overclocking limits, tweaked performance at high clocks. Donation link in case you want to buy me a beer Thanks and cheers! Hey, big thanks from the ASUS ROG FORUMS! Do you think this will work with the ASUS G55vw ? But thanks, this overcomes a tremendous milestone for our laptops. Well, I don't know... Asus is a bit weird when it comes to mobile GPUs... for whatever reason they don't adhere to the MXM standard, probably because they want that the users have to buy new machines instead of being able to upgrade them. The Dell VBIOS might work... but it's also possible that you get a black screen with it. I can take a look at the G55 vbios when I find some time. Alright, if you could take a look at the G55 vbios that would be great. Also, what do you mean about the Clevo 660m working with a g75vw? Is it the g75vw running a different bios (clevo?) and getting higher clock speeds? Thanks! I mean that I flashed the Clevo card with a G75 vbios and it works nice in a M15x, I take the best from each world, hahahaha. Anyway, regarding the G55vw, can you check something for me? I'm not sure whether the vbios is part of the bios or whether there's a separate vbios rom on the board... Can you dump the vbios per GPU-Z or per nvflash (DOS)? If so, please upload it here. svl7, does the dell 680m +100mhz edition comes with modified voltage? so it is possible to overvolt dell 680m?cause now i'm having hard time in deciding whether to go with AW or Clevo. have anyone tried the MSI 680M bios on a Clevo 4GB card? Oh yeah. All those epic 3DMark scores you see the 680M GTX's hitting are Clevo cards with MSI vBIOS. Thank you for your answer. Do yo know if the flashing method is the same as before:nvflash -4 -5 -7 bios.rom from a DOS USB? I thought it was 4 5 6 but @svl7 should be able to tell you for sure. Yeah, I did, but I can't overclock the card per software in my system, so I just cranked up the clocks in the vbios, hahaha, got it stable up to 1330MHz (at least stable in 3dMark11). Did you try using the lastest DOS version of Nvflash? If possible, post a dump of your vbios. Yeah, as Xonar says, use -4 -5 -6. You probably need to override the SSID, stupid nvflash. Hi svl7, I have just installed a Clevo 680m 4Gb in an Alienware M17xR3, and it works really great (http://forum.techinferno.com/alienware-m18x/1860-incoming-clevo-680m-4gb-aw-m18x-r1-3.html#post23778). I am puzzled that the vendor ID is 1028 (Dell), instead of 1558 (Clevo), Do you think it will be possible to flash it with the Dell Bios (I know Dell cards only have 2Gb, but I think the nvidia bios just check whatever memory you have)?, the idea of flashing it with dell bios it is to recover the 3Dvision in case Dell chooses to support it, or if in the future I buy a M17R4 motherboard. Where did you get the 680m? Eurocom? Well, hahaha, that explains a lot... for some reason they seem to flash all card for AW users with the Dell vbios, even the 7970m... LOL. Seriously, as if this would solve all the possible issues (it doesn't). At least it allows you to use the Dell drivers, well... if you want you can still flash a Clevo vbios. Some more Dell 680m mods, @widezu69 and all other user who flash them -> please provide some feedback, I need to know how well they work, can't test them myself. Let me know what you flashed and how well it worked. Thanks. 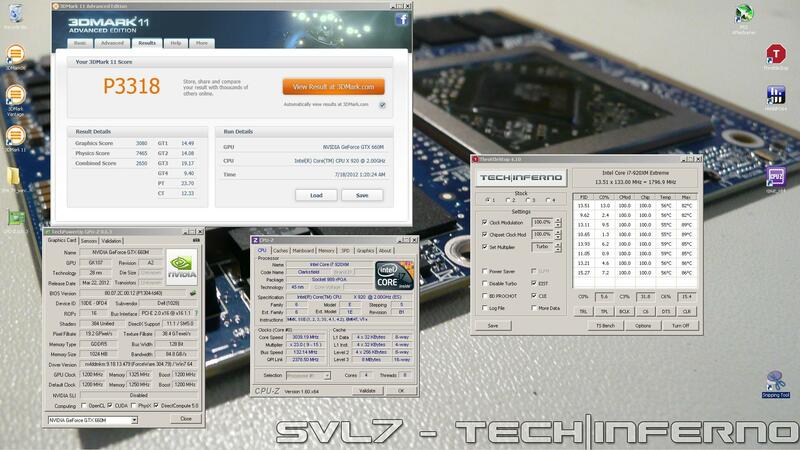 Have you heard about the "Siltius" vbios mod, that has been used by "Meaker" to break 8.000 in 3dmark11? Can you post a dump of your vbios? Yeah, Saltius did some nice work there. Tomorrow I'll post it, right now I am away from my computer.